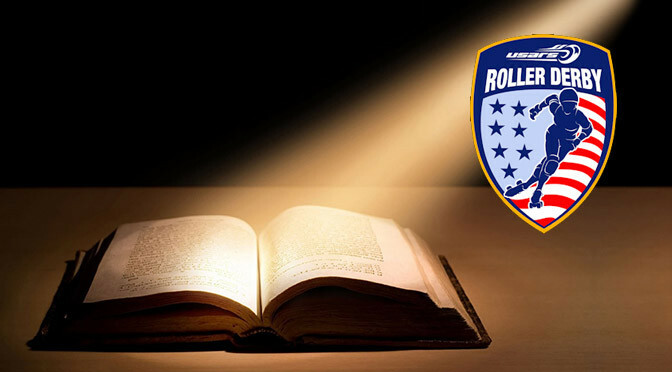 The USA Roller Sports roller derby program is now entering its fourth year of existence, and having just released the fifth edition of its rule book, it has also reached a crossroads. After a strong initial showing in 2012, participation in its regional and national tournaments has been on the decline, both in quantity and quality. Yet the players and teams that play USARS derby are consistently very happy to do so, finding it more fun to play than the prevailing alternative. This positive word-of-mouth is helping the number of USARS teams grow out to new areas, albeit very slowly. Of course, “slow” isn’t a word that USARS likes to use to describe the gameplay it is trying to promote, which it wants to be fast, fast, fast. But sometimes, it can be too fast, thanks to a rule-created situation that USARS still hasn’t quite figured out how best to resolve. There are clear signs that it is progressing toward a definite end goal on the matter, but it’s (ahem) slow going. We’ll touch on that a bit later. As for changes that have been made to the rules text in 2015? If you laid them all out in writing, they would have made up the first four paragraphs of the article you are reading now. The edits are that minuscule. You can find those changes in the new rule book, linked below, with all the other official rules-stuff that USARS makes available to everyone. As always, quick links to the important stuff can be found in the Roller Derby Rules Center sidebar of this very website. The light level of changes to USARS rules this year means this will be a pretty small rules analysis. To pad it out some, we’ll also take a look at the philosophy that USARS uses to come up with its rules, as published in public beta testing documents, that might help explain why its rule book is managing to stay small yet robust, even after publishing its fifth edition. Earlier this year, skater numbers have been in the news. USARS is also hopping on the controversy bandwagon, as it were, by finalizing in text form a change to the rules regarding jersey numbers that players must wear on the track during gameplay. This rule change was phased in over two updates. The 2014 rules disallowed letters within jersey numbers, but still allowed them to range into the hundreds and thousands. For 2015 and beyond, that provision also goes away, leaving players on a team with a variety of one- or two-digit numbers to choose from. Implementing this rule now, while USARS derby is still relatively small, is a smart long-term play. In making things as simple as possible for officiating, in documentation, and for announcers and fans tracking the action, everyone can keep the focus on things that are actually important, without the small stuff getting in the way or disrupting too many players in doing so. Within the USARS community, no one is complaining a bit about this change. In fact, most started fully complying with it last season. But there is a small issue with it happening now, even if it has less to do with USARS than it does with most everyone else playing roller derby these days. However, the change does not affect pick-up scrimmages or non-sanctioned bouts, so most players won’t have to worry about this in either case. It’s almost a non-issue for a majority of USARS/WFTDA crossover teams, therefore, but it is something that those looking to double-dip seriously may need to watch out for. The motto of USARS Roller Derby is “Moving Forward.” In the broader sense, that’s its way of saying that it wants to try and open up new and more accessible opportunities for more roller derby players. But taken literally, it means that on the track, gameplay is to be strictly done in the forward/counterclockwise/derby direction. Stopping on the track during the course of normal USARS gameplay is forbidden. (Skating clockwise? Right out.) There are exceptions to this, of course, for players that briefly cease movement while recovering from a block or a fall, avoiding a collision, or yielding gained position after a track cut. For 2015, USARS added a new exception to the “don’t stop—or else!” list. This is actually a very important addition, one that should smooth out a common gameplay problem. e. Waiting while out of play and ahead of the most forward blocker in the Pack. When one team has a blocker-goat trapped behind a wall and uses it to slow down the pack, the goat’s teammates will often get strung out ahead of the goat pen while playing defense, pushing them forward and out of play. Once there, they can become trapped. They want to drop back into the pack to regroup, but they can’t skate clockwise to do so. If the pack (and goat contained therein) is moving forward very slowly, the out-of-play players wouldn’t be able to skate any more slowly without coming to complete stop, which was also illegal. This led to situations where out-of-play skaters are forced to remain out of play for an extended period of time, since the best they could do was match speed with the pack behind them. The rule change alleviates this problem by allowing these stranded blockers to come to a stop, putting them in a position where they know the pack will have to come forward to them no matter what the other team tries to do. This way, they have a fair chance to get back in the play. Under the old rules (yellow) players were sometimes forced to remain out of play, skating slowly forward (red circle) at the same speed as a slow pack behind them. This year, these players may temporarily stop and wait for the pack to catch up to them. Players doing this will need to be careful that they resume skating as they reintegrate with the pack, since the stopping penalty will kick in should a flat-footed skater not be moving once they gain pack proximity. Given the nominal speeds of the average USARS pack, the amount of stoppage time needed by a forward OoP skater should typically be next to nothing. But during those instances where a player needs to wait, it will be nice knowing that the delay to get back into position will be much shorter moving forward. Those were the two most significant changes to the USARS roller derby rule book in 2015. With them, USARS also took the liberty of sprinkling in a few clarifications to existing rules to help shore up the definitions and procedures contained therein. But even they were scantly necessary. RD30.02 Seating. Six (6) seats will be provided for the penalty box; three (3) seats will be clearly designated for each team, however, the seats will not be marked by position. Players must be seated in the penalty box in order to serve a penalty, except for the last 10 seconds of their time, during which they will be allowed to stand in front of their seat. The seat does not become available until the player has completed the full length of her/his penalty time. Due to the added complexity of jammer and pivot abilities in the USARS game, there is no active scorer (née jammer) penalty chair. Instead, it’s just three seats where any penalized player will sit regardless of current position. This was implemented last year, and it took some time for players and NSOs new to USARS to adjust to what is a different system than many are familiar with. The newly added text, as underlined above, was added to completely clear up another difference: An open seat in the penalty box is not to be taken literally. Even if a player is standing up in the box and their fanny isn’t parked in a chair, that seat is not available for someone else to begin serving a new penalty until the player in front of it physically leaves the box. However, a good number of USARS games are averaging only 20~30 penalties, and often even less than that.3 Because of the tendency for games to be light on whistles, there is an extremely small chance that players will be stacking up to the point where penalty box musical chair situations will cause major problems. Another in-line rule clarification has to do with the procedure revolving around cutting violations. During the USARS National Championship tournament last year, there was a lot of confusion and misunderstanding on the part of players who cut the track. Part of this was still them getting used to the fact that it wasn’t an instant penalty. But a lot of it was that they didn’t even realize they advanced position illegally, and how it was sometimes difficult for referees to inform them that the did. USARS is now making it clear that referees can grab the attention of cutters with a whistle, which should get the player to turn their head to see the cutting the track hand signal. Note that even with the whistle, the “penalty” for this infraction is still a mandatory recycle to the rear of the pack—not a trip to the box. And finally, a clarification on the conditions for the lead jammer-scorer under which they are allowed to end the jam. This is better known as the “must score to call it off” rule, even if that isn’t entirely correct. More accurately, the lead scoring player must merely pass an opposing pack player, whether they score on them or not, to be eligible to end the jam. The clarifying phrase, whether the blocker is in or out of bounds, sounds as if it was added to make this rule plainly obvious in case a jammer gets a no pass/no point at the rear of the pack. If both the lead jammer and an opposing caboose-blocker both go out of bounds, upon skating back into play a jammer call-off would be accepted if the unscored-upon blocker was behind the jammer. Aside from a handful of other minor changes4, that’s really all there is to talk about in the 2015 USARS roller derby rules update. With no major gameplay alterations, and only the clarifying additions above, it is largely a carbon copy of the 2014 rule book. The consistency from last year to this year is welcomed by USARS players and officials, who don’t need to memorize anything new or change the game that they are used to. However, standing pat for 2015 also means that the biggest rules issue facing USARS Roller Derby won’t be going away for at least another year. Due to the setup of USARS pack definition rules, any team that fails to keep a blocker goat contained will lose the privilege of dictating pack speed. As a consequence, the team earning forward pack position will sometimes decide to pull the Ludicrous Speed lever and make the pack go to plaid, moving so fast that not even their own jammer can catch back up to it. This generally creates extremely boring derby in the process. However, last year teams started to realize that if done against an opponent that’s not up to speed, the runaway pack strategy could lead to easy points. 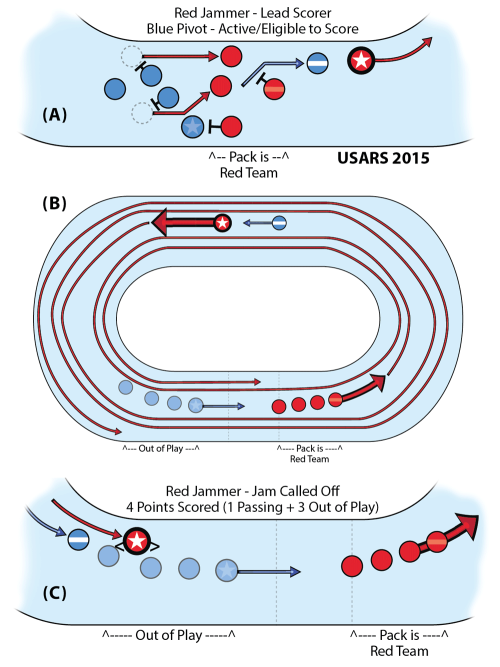 In allowing opponents to tire out and slowly drift backwards out of play, an incoming jammer can simply skate around the most rearward blocker—who cannot engage without picking up a penalty—and then call off the jam to collect a comfortable 4-0 jam win, even during a tight jammer race. How? Once one point is picked up, all out-of-play points ahead of the jammer are immediately awarded—even if those out-of-play blockers are still behind the pack. (A) Red gets out for lead, but the blue team loses pack containment. (B) The red team uses their pack advantage to speed the pack up to the point where it will take several laps for their jammer to get into scoring position. (C) This causes the blue team to fall out of play. Once the red jammer passes one of the blue players, without resistance, she will get all four points due to the other three blue blockers ahead of her being out of play. It should be said that a team that heavily relied on this strategy narrowly lost a game at Nationals. Instead of engaging the opposition to slow the pack and to help their own (lead) jammer score more quickly, they skated away from her, leading to 0-0 jams. Those five or six good scoring opportunities could have turned into 5 or 6 points, potentially turning the game to their favor. Despite this, it worked when it did, in mismatches especially. It was also painful to watch and annoying to skate in, even if a team’s defensive ineptitude was rightly being punished. Click for the PDF of the USARS derby 2015 Runaway Pack rules beta test document. 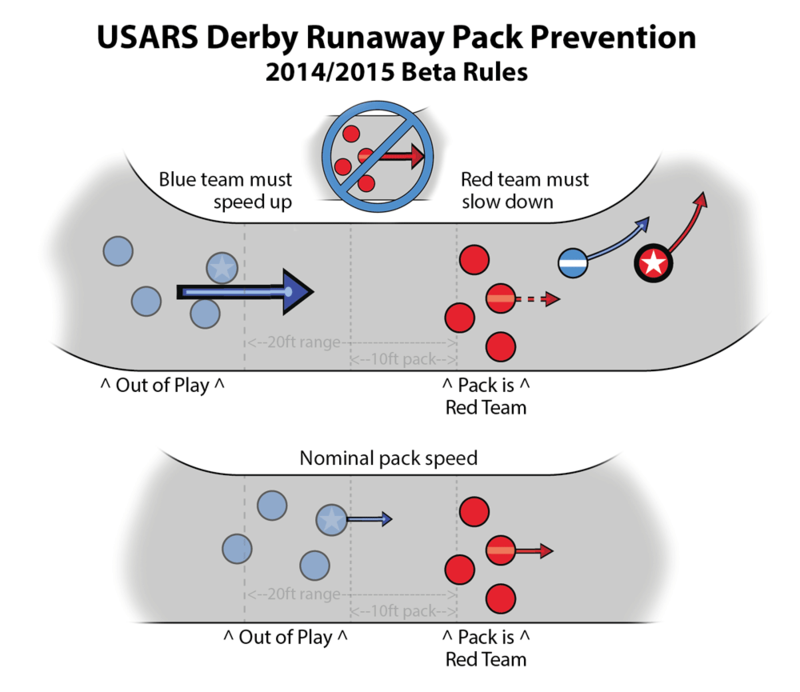 In order to help resolve this issue, USARS late last year published proposed solutions for the runaway pack problem (PDF) and invited interested teams to test them out and provide feedback for a potential 2015 rules update. As it happens, the ideas they put forward in that publication were pretty much the same as the ones USARS put into beta testing two seasons ago (PDF) for the 2014 rules update. So this is something that has been in the works for a few years now. Putting an end to the endless runaway pack situation, which USARS says “inaccurately catalogs” their style of play as a “speed race” in the eyes of a few people, has been tough going. But USARS has a consistent vision on what the the game of roller derby is all about, and clear premises on what it wants in an ultimate fix for this specific problem. Because of this, USARS is confident they will solve the issue eventually. The information contained in the beta document was quite thorough in laying out to teams what the goals of the tests were. Instead of just providing some rule changes to try out and then leaving it at that, USARS prefaced its proposed rule changes with a set of four principles that explained to teams how these changes would remain consistent with the way of USARS roller derby. 1) Do not punish or disadvantage the front team for defeating opposition containment and gaining control of the front of the pack. 2) Do not reward or advantage the team in the back for failing to defensively contain the opposition, but give them a fair chance to catch back up to the pack. These two ideas fall in lock-step with the USARS pack definition rule. If one team can get to the front of the pack, that’s because the opposition let them get to the front of the pack.6 USARS wants to keep this dynamic in place, which forces blockers to engage blockers at all times. The problem, of course, is what happens when one team can’t keep their pack defense going well enough to prevent opposing blockers from breaking through, usually causing a runaway situation. The issue at hand isn’t that the runaway is happening, but rather that one team was bad at playing defense. In these two bullet points, USARS is telling teams it still wants to punish the bad team for screwing up on the play, but not to the point where any chance of recovery is impossible, as it often was in runaway packs. USARS wants to give skaters every available opportunity to gain advantage or recover from poor play through natural gameplay occurrences, rather than let over-officiating or forcing penalties be the only way out of a pickle. Going off of the first two premises, the bad team that let the opposition gain the front of the pack has an obvious motivator to not let that happen again: Do a better job blocking the opponents in the pack, and the pack won’t get away. But this needs to apply to the other team, too. Should it get to the front, it needs needs stronger motivation to slow the pack down than it does to speed it up. Instead of trying to fix things by issuing penalties to a team that tries to run away from the opposition, USARS wants to try to resolve the problem by making it more enticing for the team in the front to attack the opposition and score points directly, compared to all other options. 4) Though a rare occurance, fans don’t like it when runaways happen. However, the fix “should not sacrifice the speed of the game or the philosophy behind the rules,” which fans like. Even if it only happens in a few jams in a game, that’s a few times too many for USARS. But the slippery slope it is treading is trying to find a way to solve this one issue while keeping the overall style of gameplay the same. This is a tough ask. 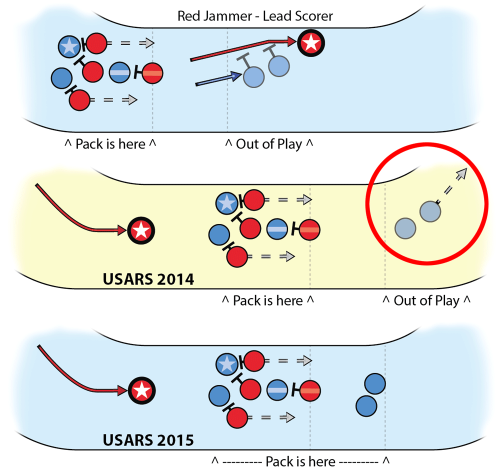 The thing that drives USARS gameplay is the same thing that ultimately leads to the problem of too-fast packs in the first place, particularly among new and inexperienced players and teams. USARS does not want to eliminate the runaway in a way that destroys its “moving forward” gameplay mantra, but there aren’t a lot of options to do this without potentially compromising things elsewhere. Sticking to these four premises, USARS Roller Derby has come up with some potential solutions. The two they are focusing in tackle the problem in different ways, though they share the same gameplay mechanics and trigger mechanism. With its beta proposals, USARS wants to introduce a 20-foot zone that forces engagement between teams7, but not in a way that allows everyone within it to freely engage opponents. Instead, a 20-foot “range” would be implemented that both teams must stay within, either by the team in the rear speeding up or the team in the front slowing down. In other styles of gameplay, this would give the team in the rear a huge advantage. If they wanted to keep the pack slow, they could simply move slowly and not come up to the team in the front, forcing the team in the front to stay slow against their will. However, the crucial difference that would make this work in USARS play is that 10 foot pack proximity would still apply, and the team in the front would still be considered the pack. If there is a runaway and the team in the back slows down, that would force the team in the front to also slow down to stay within range—but it would also keep the team in the back in an out of play state. This gives them no real advantage, other than a better chance to work at regaining pack control. 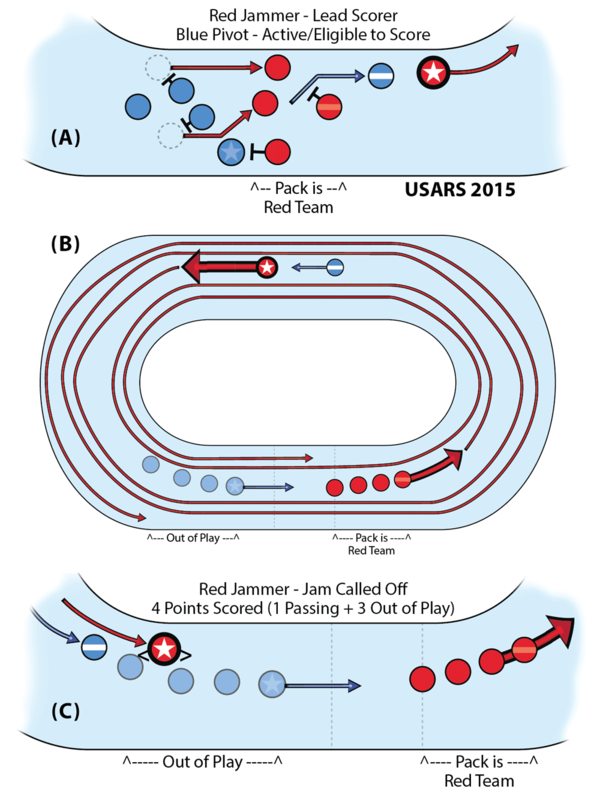 When there is more than 20 feet of separation between the two teams, USARS wants to force the team in the front to slow down instead of speed up, but not in a way that lets the team in the back dictate the pace of play. In this example, the red team is free to keep the blue team out of play by continuing to skate forward, but at a nominal pace. The question facing USARS about this setup would be how to elegantly integrate it into gameplay without confusing players and fans or making officiating any harder than it is. Here are the two best ways it has of trying to achieve that. This makes the 20-foot range a soft requirement. Teams that drift further apart than that on the track will have a few seconds to slow down/speed up as required, to make sure both teams remain no further apart than 20 feet. To enforce this, USARS is proposing penalties be issued for individuals most responsible for not maintaining the range requirement, which could go to blockers in the front group (the defined pack) for not doing enough to cease with the running away. There would be a warning issued to teams, by way of a new referee hand signal, before the penalty is actually whistled. USARS provided a flowchart to demonstrate how this proposed rule would work. This solution is called the “slinky rule” because of how such requirements would make the two groups of blockers behave as if it were slinking out and in—alternating speeding up and slowing down.8 The team in the front (the pack) will want to speed up keep the team in the back out of play, and the team in the back will want to slow down to have a chance to catch back up to the pack. This juxtaposition creates the fluctuating pack speed. The thinking here is that the pack will have spurts of slow lasting long enough for a team’s jammer to catch back up to the pack a lot faster than before. This should severely curtail the already infrequent runaway issue without doing much to alter the mechanics of the severe advantage/disadvantage gameplay situation that the teams are faced with. However, the way USARS is pitching this idea violates one of its own principles, that of trying to avoid using penalties to force action. The proposed beta rules language is also a bit anti-USARS, requiring a convoluted explanation that requires a lot of words to get across. This may not be the best way of fixing the issue, particularly when compared to the other proposal. This makes the 20-foot range a hard requirement. Once the teams drift further apart than that on the track, the head referee will immediately blow his whistle four times to end the jam. This method has the obvious advantages of stopping runaways before they start, being easier to implement for officials, requiring much less new rules text, and being consistent with other rules in the USARS game about head-ref jam call-offs.9 At first glance, it would seem this would have the disadvantage of being easily abusable by teams, but in practice there is little that can go wrong with it. If the rear group tries to get clever and deliberately end the jam by hitting the brakes (but never coming to a complete stop), letting the front group skate too far away, the rear is also deliberately putting themselves out of play. If the opposing jammer is barreling into scoring position, that’s a recipe to get scored on and/or get out of play engagement penalties. Knowing the rear group has this ability, the front group will play it safe and stay much closer than 20 feet, since it needs to be sure it doesn’t accidentally end a jam that it could score a lot of points in. This would completely eliminate the motivation for them to blindly runaway, replacing it with the motivation to see the jam through to a more favorable conclusion. If USARS wants to give the rear group a chance to get back into the play, this method would probably be better. With the slinky method, the 20-foot range would always be used to its fullest; with the jambreaker, the front and rear groups would be closer to the 10-foot range, about the distance where rearward players would naturally come back into play, able to engage an incoming jammer. That, in turn, may make it more likely for the front group to drop back to engage the opposition so as to help their jammer and maintain the ability to end the jam—solving the runaway issue once and for all. Except…it hasn’t been solved once and for all. At least, not for 2015. For whatever reason, USARS has declined either of these potential fixes for the second straight year. The reason? Speculating, but may have to do with the small number of teams playing USARS roller derby, which currently is around two or three dozen clubs and leagues. When testing out rules that can significantly change an aspect of gameplay, it can be a disadvantage to not have an army of skilled players and experienced officials to see how well they work in a wide variety of gameplay situations. It would be understandable if USARS didn’t yet enough information come a definitive answer on the matter. However, the USARS Roller Derby Committee has an advantage in that it knows the kind of game it wants to develop and promote. In sticking to established sporting principles, like ensuring fair competition and making players work hard for positioning and harder for points, it can immediately identify things that don’t work, eliminate them, and keep the focus on perfecting the things that do. It is for this reason that the USARS roller derby rule set has seen only minor to moderate changes over the last few years. After a volatile first year, the rule book has stayed clear, compact, and consistent. There’s no doubt that the rules will eventually begin to grow in size if more and more teams pick them up, but with the focus USARS has, any such growth will be slow and steady. USARS has made it known that it’s here to play long game, and if that means being, ironically, the tortoise going up against the hare, that’s what it will do to finish crafting and perfecting the game that the organization and its skaters want to showcase to the country. If things fall the right way, maybe the world, too, though that’s a discussion for a year or two from now. Now that USARS Roller Derby has been granted autonomy from the USARS mothership, there is a lot of potential for the group to further stake out its little corner in the roller derby universe.10 How that will eventually lead to stronger tournament participation and a larger footprint in the community is still to be determined. But it is certain is that USARS has the right philosophy to guide its roller derby rule set and gameplay style to where it needs to be in the greater sports world. Though there are many other things USARS needs to do to make a bigger impact, it’s moving forward knowing that the most important thing is being taken care of just fine. For now. If the number on the back is 2 digits and 6″ tall, that covers both USARS (2-digit numbers, 4″ tall) and WFTDA (4-digit numbers, 6″ tall) just fine. The other change is to the penalty box capacity rule, RD60.02, which echos this change and adds clarifying language to the box exit procedure. The cleanest USARS game that I am aware of is this one. It had only nine penalties total in a full 60-minute bout, both teams combined. Nice! The rest of them: A new “juniors game” category of gameplay, age range clarifications for the other gameplay categories, an overtime timeout clarification, and adding “hands” to the forearm class of penalties. Which is a really dumb thing to do if the team doing this is behind on the scoreboard toward the end of the game. Just sayin’. Virtually every USARS jam starts with both pivots at the front of the pack, ahead of all the other blockers. Three opposing blockers must pass the pivot for that team to lose containment, not to mention all the team blockers behind her, which means both teams always have the same chance to prevent a runaway from occurring in the first place. In USARS, there is no such thing as a 20-foot engagement zone. A player is either within 10-foot pack proximity and in play, or out of the pack and out of play. There is no in between. RDCL banked track roller derby has a similar function for its pack definition rule, although pack proximity is much tighter and all blockers may still engage in the meanwhile. See our most recent RDCL rules analysis for an example of this phenomenon in action. RD60.04 Jammer/Pivot Penalty. … If both Active Scorers (or both Jammers who have not yet attained Active Scorer status) are seated in the penalty box at the same time, the head referee will call off the jam and begin a new one. If it doesn’t run out of money to operate first. But that’s neither here nor there.